But none of this resolves the biggest single issue we are seeing. Customer both Business and Consumer with computers that should have bee retired many months or even years ago. Problem is they end up failing, and the the client wants their data back, without it costing anything? So what can you do about it. Data recovery could cost anything from £100 to , well £1000's. Home User change your computer regularly, back up your data, online, or an external device (use a usb memory stick and not an external hard drive, you can guarantee the drive fails at the same time your computer goes. If you run a business, well you should be backing up in any case. But with our clients we recommend a system that should last for about 5 years, write it down over 3 years, and if you have to replace it then, well no problems, it's been written down. If it lasts for 5 years well happy days. Windows 8, the follow-up to Windows 7? Windows 8 differs radically from what comes before. Windows president Steven Sinofsky claims that Windows 8 represents a “generational change” for Windows, the likes of which has not seen since the release of Windows 95. Windows 8 is made to run on both laptop and desktop computer and tablet hardware, scaling its interface to different screen sizes. Windows 7 had a problem on tablets is that it was first and foremost a desktop OS, with tiny fiddly icons designed for a mouse pointer and not chubby fingers. 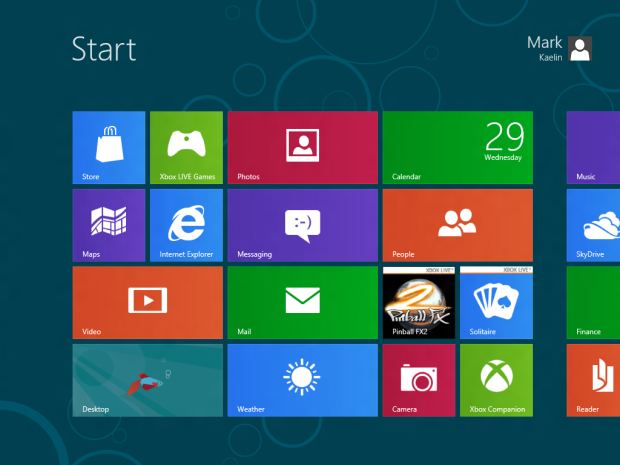 That’s why, with Windows 8, Microsoft has devised a tile-based interface called Metro that is designed around touch. So what’s Metro got to offer? The interface is based around interacting with tiles, basically large icons whose size makes them easy to touch. These tiles can be tapped or clicked to run local or web apps, or to go to websites. Tiles can be swapped in and out of blocks, for instance to build blocks of apps or sites that are most commonly used, or related to specific topics like work. Tiles also link to online services like the Windows Store, where users can buy new Metro apps, and system settings like Control Panel. Certain tiles can be set up to display dynamic information. For instance an RSS reader tile can display the latest story in the feed or a calendar tile could show your next appointment. In this way real time information can streamed straight in to the Metro start screen. Navigation of the Metro start screen is well-suited to touch, with users able to drag and pinch-and-zoom to manoeuvre through blocks of tiles and to rearrange tiles by dragging and dropping, or resizing them with their fingers. Edges of the screen also play an important role, bringing up bars for quick interactions with the system or an app, and a touchscreen keyboard can also be summoned to enter text. Navigating the apps themselves is again designed to work well with touch, with easy to hit icons and tiles, and single gesture swipes to perform tasks such as flicking through running apps or shutting down an app. Then you can use mouse and keyboard to navigate Metro. Some users of the developer’s build of Windows 8 complained that Metro is not intuitive without a touchscreen, but Microsoft has sought to address this with a host of mouse and keyboard shortcuts. For example mousing to the corners of the screen allows for fast navigation, and apps, files or settings can be called by typing a name, or just the first letters of the name, into the Metro start screen. Also all of the hotkeys from Windows 7 work in the Windows 8 interface. Microsoft’s goal with Windows 8 is, after all, for it to be as easy to use on a tablet as on a PC. The Desktop is still there but as a Metro app, as Windows 8 users log into the Metro start screen. The Desktop app is a full-screen Windows 7-style desktop, with the usual Recycle Bin, Internet Explorer, Windows Explorer, and taskbar. On a traditional Intel or AMD-based PC hardware the desktop will run legacy apps, such as those that run on a Windows 7 machine. However ARM-based hardware, such as most tablets, will not be able to run third party Windows desktop apps in Windows 8, only Microsoft desktop apps such as Notepad and Calculator. The desktop can even be used with touch. Those who recall trying to hit tiny icons on a tablet running Windows 7 will be pleased to learn that Microsoft has implemented what it calls “fuzzy hit targeting”, which works out which button or icon it’s most likely you wanted to trigger. Reports are that it’s not perfect but is an improvement over Windows 7. Does the cloud get a look in? Of course, online integration is woven throughout Windows 8. On the social side the Metro People app allows contacts from multiple sources and social networks - such as Facebook, Twitter and LinkedIn - to be mashed together into a single stream, with live updates from individuals or groups displaying on tiles. There’s also some serious syncing. Sign into Windows 8 using a Microsoft account and it will sync your settings between every Windows 8 machine you use. This will let you share your address book, account details for services like Facebook and Twitter, email and instant messages and the like between different devices. On top of this there’s the ability for users to sync apps they’ve bought from the Windows Store or files stored on Microsoft’s SkyDrive service between devices. Perhaps the most impressive feature of Windows 8 is how it integrates online information with what’s stored on your machine. Metro’s simple search will not only scour file, apps and settings on the device, but also look within apps that have been enabled to take advantage of the search feature, for example looking for a track in a music app or a contact in a social network. There’s the fast boot time, Microsoft demoed Windows 8 booting in eight seconds on an ultrabook at the recent Mobile World Congress (MWC). There’s also an easy reinstall option that allows a clean install of Windows without the need to delete any personal data stored on the device. And for sheer wow factor there’s its ability to work with some gigantic screens. At MWC Microsoft demoed Windows 8 running on an 82-inch display with multiple people using it. Microsoft said that up to 10 people using all their fingers could interact with the display at the same time. What’s Windows 8 got to offer business? Windows 8 contains a range of features relevant to enterprise - helping to mange consumerisation, encryption, remote updates and virtualisation. Some of these features can be found in preview builds released online, others are mentioned in Microsoft documentation. For a start, having a single OS that can be used on a desktop or laptop PC and a tablet may appeal to enterprises looking to provide and manage a single computing environment for staff inside and outside of the office. Many features aimed at business are designed to make it easier to work outside the office. DirectAccess allows remote users to access the corporate system without having to sign in to a separate VPN connection, however Microsoft hasn’t yet spelled out how this link will be secured. Meanwhile Windows To Go allows Windows 8 to boot from an external flash drive - allowing staff to access their corporate OS from a personal device without having to copy corporate data onto its hard drive. The flash drive can also be encrypted with BitLocker to provide additional security. Managing the costs of remote workers will also be aided by built-in mobile broadband metering and native support for 3G and 4G telecommunication. Businesses will be able to develop their own Metro-style enterprise apps, which can then be centrally managed, updated and distributed by managers. Apps and any data they contain will be able to be kept within the corporate firewall. The ability of Live Tiles to display dynamic information allows for the creation of corporate apps that act as dashboards, for example displaying real-time feeds from enterprise systems. Another feature that promises to make IT managers life easier is the integration of Microsoft’s HyperV client, its virtual machine manager, into the OS. The integrated HyperV feature, a Windows Server 2008 compatible tool, should allow CIOs to manage multiple configurations of virtual machines from a single device. Migration from earlier Microsoft OS to Windows 8 should be eased by the migration tools that automate the process, such as the Application Compatibility Toolkit and User State Migration Tool. Microsoft is also making sure that Office 15, the next release of Office, shares Windows 8’s ability to work on a touchscreen tablet. The package has been redesigned to incorporate a Metro-style tiled interface, while retaining the ability to be used with a mouse and keyboard, and the code rewritten to work on ARM processors, as well as 32 and 64 bit Intel and AMD chips. The Windows 8 consumer preview will run on just about any recent 32 or 64 bit desktop or laptop, as well as running on modern ARM-based tablet computers. Microsoft recommends a 1GHz processor, 1GB of RAM (or 2GB for 64-bit), 16GB of storage (or 20GB for 64-bit), and a DirectX 9 graphics card with WDDM 1.0 support. One other important requirement is that Metro-style apps need a minimum of 1024×768 screen resolution and a 1366×768 to use the snap feature that allows apps to be run side by side. There’s been no official announcement but reports indicate a release schedule similar to Windows 7, predicting that it will turn up on new hardware in October this year.